A Russian rocket blasted off today carrying three new navigation satellites but failed to reach the proper orbit, Russian space officials have announced, with some reports stating that the satellites crashed into the Pacific Ocean after launch. 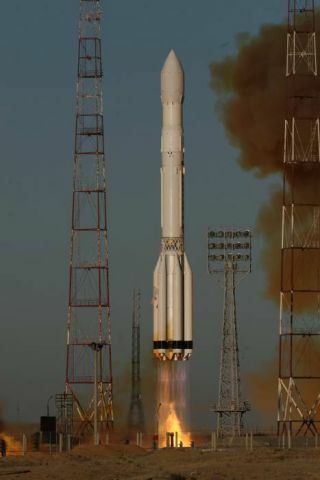 The large Proton rocket lifted off from the Central Asian spaceport of Baikonur Cosmodrome today (Dec. 5) carrying three new additions for Russia's Glonass-M navigation satellite constellation. The launch failure occurred shortly after the scheduled 5:25 a.m. EST (1025 GMT) liftoff. Some Russian news outlets, citing an unnamed source, have reported that the satellites crashed into the Pacific Ocean north of Hawaii. "Three Glonass-M satellites fell into a non-navigational area of the Pacific Ocean in some 1,500 kilometers northwest of the city of Honolulu, administrative center of the state of Hawaii," the Russian newspaper Ria Novosti quoted the source as saying. Glonass-M satellites are craft that perform a navigation service to civilian and military customers in Russia similar to U.S. global positioning system satellites. Each satellite weighs just over 3,000 pounds (1,415 kg) at liftoff and is designed to last seven years in orbit, according to the satellite fleet manufacturer Information Satellite Systems Reshetnev Co. There are 26 Glonass satellites in orbit today, two of which are reserved as spares. The operational satellites fly in three groups of eight to provide global navigation coverage, Federal Space Agency officials have said. The satellites that crashed today today were the third batch to be launched in 2010. Three Glonass-M satellites were successfully launched in March, with three more reaching orbit in September. A new series of Glonass satellites, the improved Glonass-K model, is in development, ISS-Reshetnev Co. officials have said.